The political war within the American bourgeoisie rages. Whilst the "America First Slogan" has the regime demonizing almost every foreign power, from China and Iran to Germany and Mexico, the relentless focus on Trump’s alleged Russian links is like a re-run of the past. When one watches video footage of the US Congress talking about Russia, they are often still referring to it as the Soviet Union. US Senators rail about Russia having committed an "act of war" from the floor of the US Senate. One Democratic Party-aligned television commentator was even claiming that Russia was now completely in charge of the US. There has been a sustained level of agitation in the US media against Russia for some time but it has been sustained at a particularly high level since the Democratic primary election. The public mind is being ideologically prepared for war. The anti-Russia campaign diverts the hostility of workers into hostility towards Russia but despite the Russo-phobic indoctrination there is still widespread skepticism and hostility towards further wars. The loyal opposition Dems have no intention of seriously attempting to block Trump's political agenda. They also know that with Republican-controlled majorities in both houses of Congress there probably won't be an impeachment. As long as Trump keeps making space for generals in his cabinet the military will be on his side as surely as they stood behind him during his inauguration. The political climate has gotten so repressive that emeritus journalist Seymour Hersh, famous for first writing about the My Lai Massacre in the Vietnam War had to go the German press, to Die Welt, to have his articles published. One of the most respected senior Pulitzer Prize winning journalists in the US is blackballed in the American media for having written an article in April questioning the Pentagon official line about another chemical weapon attack story in Syria. Despite the outward weaknesses evident at the highest levels of power in the US, it must rely ever more on military power. A circus of scandal around the present leadership in Washington doesn't necessarily hurt their imperialist interests. For the elements of the bourgeoisie maintaining an ignoramus on the throne serves as a useful form of intimidation both to the working class in general and to other imperialist powers in particular. In the current propaganda offensive, the truth matters less than the motives behind the message, and behind the motive lies the aim of ideologically preparing us for conflict between nuclear armed imperialist powers. 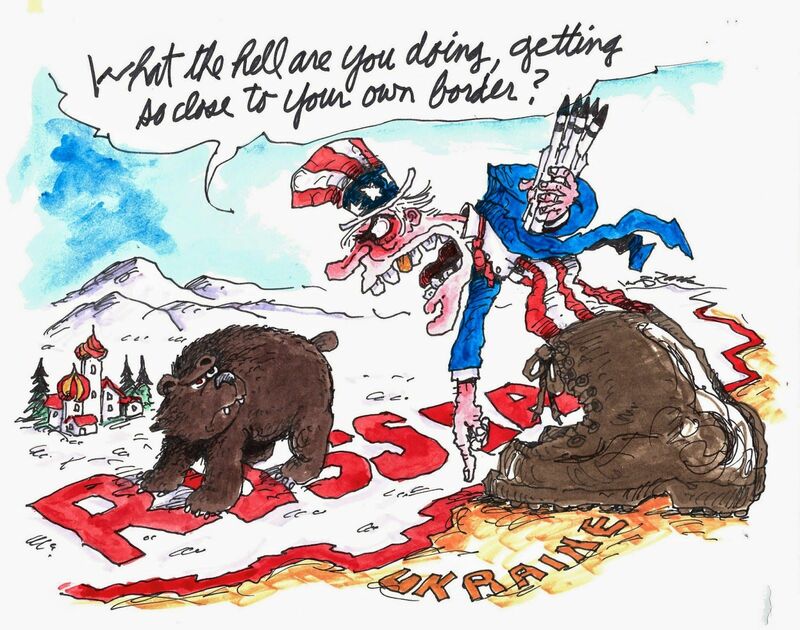 The current imperialist stand off between the US and Russia is one where Russian imperialism is trying, with some limited success, to hold on to what’s left of its' imperialist sphere of influence. Back in 2015, then US Vice-president Joe Biden stated the dominant idea among his fellow rulers, "We will not recognize any nation as having a sphere of influence." This sort of thing has been said by US leaders ever since the collapse of the USSR. The very idea that the world was now uni-polar and that the US was the only unique "indispensable" nation was a delusion of imperialism that could only foretell future conflicts with other powers. In the slaughterhouse of Syria, the US and Saudi Arabia have been unsuccessfully attempting to reverse the losses suffered by their mercenary proxy armies. A large portion of traditional leftist organizations have supported this conflict for its duration. Others meanwhile sided with whichever imperialist power was fighting against American imperialism. Some leftists from the West actually did choose to participate in the imperialist war and were so deluded as to think there was a revolution happening in Rojava. A revolution where warlords pile up all available commodities in an area and then force people at gunpoint to pay their prices while the air forces of a dozen countries patrol the skies. Trump's speech in Saudi Arabia denouncing Iran for support for terrorist proxy armies set another milestone in hypocrisy. Saudi Arabia soon after he had finished his visit made its move against Qatar. It is the US alliance with Saudi despots that has been the main force in the creation of the terrorist proxy armies like ISIS and Al Qaeda. The inevitable cutoff of CIA aid to the sectarian militias means that the US will intervene either through its Kurdish proxies or more directly through its small but growing military presence on the ground. The CIA effort in Syria was one of the most expensive since their support for the mujaheddin in Afghanistan in the seventies and eighties according to a recent article in the New York Times. As the war in Afghanistan drags on, many in the US are so disoriented that they have no clue just how badly the US government is losing the war against the Taliban. An unusually sober assessment of US imperialist prospects was recently put out by the Army War College, titled At Our Own Peril: DoD Risk Assessment in a Post-Primacy World. The paper acknowledges declining support for further wars, while advocating a more realistic approach that is no less committed to maintaining and expanding present and future wars. The narrative spun by the anti-Russian propagandists in some respects much like what the US actually did in Russia in 1996. Likewise the Russian government is accused of planting "fake news" on a mass scale to influence an election between two candidates who were both equally hostile to accommodation to Russian imperialist interests. The US government "assisted" the re-election of Boris Yeltsin who was so unpopular that the pollsters were coming up with single digit approval ratings. Time magazine even celebrated this election rigging with an article titled "Yanks to the Rescue". According to the account of Carnegie-Mellon University researcher, Dov Levin, between 1946 and 2000 the US and Russia together interfered with 117 elections, with the US leading with some 81 attempts to buy foreign elections. This is not including coups, assassinations and direct military interventions. The ideological element to resisting imperialism starts by rooting out all the lies and never submitting to the false construction of reality that the bourgeoisie have inundated us all with. It is easy to compromise and accept the middle-road fallacy that the midway point between a lie and the truth as being a more reasonable choice. 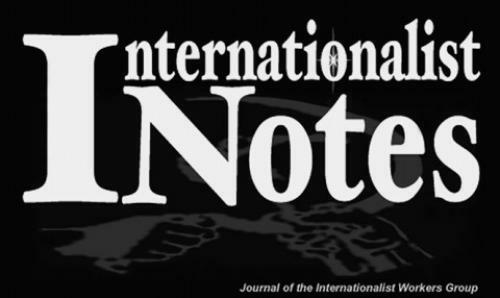 Opposition to imperialism cannot survive nuances. A "critical" stance mid-way between support and opposition to imperialism is still support for imperialism. By taking a hard line against all imperialism you avoid the ideological infection that allows the capitalists to buy the acquiescence of the exploited class. The capitalists clearly want American workers to hate Russia enough to build a basis for an imperialist war. The propaganda campaign easily penetrates into the popular conscience and like all nationalism it consists of murderers and fools proclaiming loudly that their country has been wronged. Russian workers, American workers, workers of all countries all share a common bond of exploitation and state repression at the hands of the capitalist class and their functionaries. While it is claimed that some on the left "support Assad", more often it is the other way around with groups supporting non-existent "Rojava revolutions". They vocally proclaim the "crimes" of their rival Russian and Iranian imperialists while willfully looking the other way at the atrocities of American and Saudi imperialists. The left supporters of imperialist war are the worst of the war pimps because their propaganda immediately disorients those most likely to be thinking critically and willing to fight back against the war drive. The world stands on the abyss of war and the dominant segment of the left has picked sides as they have throughout the imperialist epoch. In this situation revolutionaries should take the opportunity to put forward the class line. No war but the class war! Keith Olbermann - network media buffoon. See leftcom.org for more on this.